Want to freshen up a room? You can start with updating your lighting, removing cluttered knick-knacks, and adding some snappy accents. However, if you want to see something really different, give your room a makeover with a new coat of paint! Moreover, the correctly chosen wall color will provide a sophisticated backdrop for your collection of paintings, prints, photographs, or other artworks. Another important thing to consider if you want to get the room you will love is the quality of the wall paint. 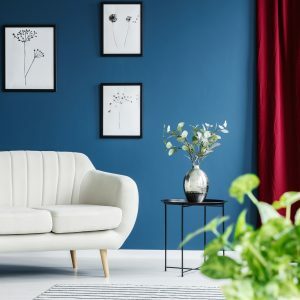 It is highly recommended that you opt for luxury paints from well-known brands that have already established their reputation in the marketplace. At Fine Art Shippers, we have compiled a short list of interior paint companies offering high-quality luxury paints at reasonable prices! Valspar is a reputable manufacturer of coatings and paints, headquartered in Minneapolis, MN. With two centuries of history and thousands of employees in 25 countries, it is also one of the oldest and largest in the world. However, what makes this company stand out from many others is that its colors look perfect on any walls. Since its very foundation in 1849, Pratt & Lambert has stood for innovation and quality in the paint industry. This company offers some of the best paints and an absolutely stunning selection of colors for any taste. Born in England in 1946, Farrow & Ball is all about high-performance paints, rich pigments, eco-friendly formulas, quality ingredients, and sustainable practices. Luxury paints produced by this company can bring any walls to life. Behr is another excellent brand to consider when selecting paint for your walls. Established in 1947, the company is currently one of the leading suppliers of high-quality paints and wood care products to the United States and Canada. Benjamin Moore, which was founded in 1883, is one more brand that guarantees the quality of its products. Moreover, the company is known for producing the most environmentally friendly paints, with no harsh fumes and zero emissions. Hopefully, these tips will help you select the right paint for your walls. Meanwhile, let us remind you that Fine Art Shippers offers professional white glove moving and art installation services, and we would be happy to assist you with your renovation. Besides, you will be pleased to know that all our services come at very competitive rates.